Building STEPS highly successful model relies on strong partnerships and expert volunteers. This collaboration and commitment enables hundreds of students each year to benefit from programming. Find out how you or your company can make an impact in bright, Baltimore city students. Building STEPS juniors visit businesses and institutions that rely on science and technology. Each seminar includes a site visit, an interactive activity and guest speakers, providing exposure to a variety of professional opportunities. Seminars are scheduled Tuesday through Friday from 9:30 AM to 1:30 PM. We are always looking to expand seminar opportunities for our students. 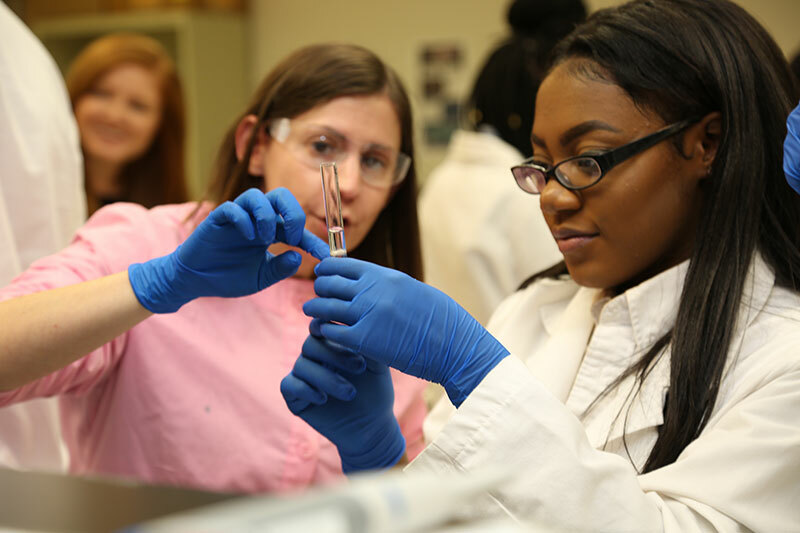 During the summer between their junior and senior years of high school, Building STEPS students gain professional work experience interning in businesses that rely on science and technology. Students are strategically placed in positions based on their educational and professional interests. This hands-on experience teaches the students about workplace dynamics, responsibilities and expectations.. Internships are a 5 week commitment, 20 hours each week, Tuesday – Friday. On Mondays, students participate in a weekly workshop to prepare for the college application process, and participate in professional development. Building STEPS partners with YouthWorks, a Baltimore City program that pays the students minimum wage for this experience. Hosting a Building STEPS summer intern is a great way to engage a Building STEPS student in a meaningful summer experience. Every Building STEPS student has a compelling college essay. However, they are often unable to articulate their experience in a cohesive college essay. Every Building STEPS’, high school senior is paired with a volunteer who helps them with their college essay. Supplementing our essay writing curriculum, volunteers assist with the development and editing process through in-person meetings and via email. Volunteers attend our four college workshops that take place September through November; and they sometimes continue to assist and fine tune remotely. This direct assistance ensures that Building STEPS students are submitting strong, competitive college and scholarship applications. As the number of student we serve each year increases, so does our need for additional writing advisors. Students occasionally request academic tutoring in math, science or English. Tutoring is weekly with a mutually agreed upon date and time, at the school or local library. This additional academic support further prepares students for the increased rigor of college academics. Tutors in all academic areas are encouraged to volunteer. A significant roadblock to college access is low SAT scores. The average SAT score for a Baltimore City public school student is 764 on a 1600 scale. Building STEPS provides ongoing SAT support, both through group programming and one-on-one tutoring. Tutoring is arranged with a mutually agreed schedule and takes place at the school or local library. Math and critical reading tutors are always needed and without question increase our students’ college options. Transitioning from college to career is challenging in the best circumstance. For Building STEPS students, with limited professional role models and contacts, the process is especially daunting. As a B Coach, you will be matched with a Building STEPS college student or graduate for an informational interview and professional insight. These interactions are extraordinarily helpful as our students begin to plan their careers and transition from college student to young professional. Programmatically and organizationally, Building STEPS welcomes volunteers with expertise in public relations, marketing, and development.